I’ve recently encountered lots of annoying Ads in my iPhone and iPad. My initial impression is what an ‘Ad serving app’! But, this is the result when you allow or agree to receive push notifications as shown below. Here are some useful tips on how to deal with it. This instruction should stop the problem, otherwise the app causing your trouble is absolutely suspicious and you should report it for investigation. How do I stop annoying Ads coming from an iPad/iPhone app? 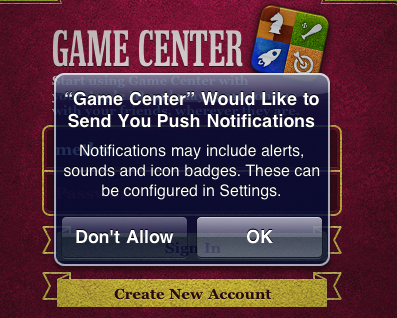 2) It will display all application with Notification ‘turned on’, then tap the application that is bugging you with Ads. 3) Turn “OFF” Alerts, Badges and Sounds. If the problem persist, you may want to consider to delete it. How to delete application in iPad/iPhone? 1) Tap the target app, hold and wait until it starts to wiggle. 2) You’ll notice “X” button in the top right corner, which means you may tap it to delete. Description: Intego has discovered a spyware application that is installed by a number of freely distributed Mac applications and screen savers found on a variety of websites. OSX/OpinionSpy is installed by a number of applications and screen savers that are distributed on sites such as MacUpdate, VersionTracker and Softpedia. PremierOpinion is part of an online market research community with over 2 million members worldwide. PremierOpinion relies on its members to gain valuable insight into Internet trends and behavior. In exchange for participating in periodic surveys on topics of interest to the Internet community, and for having their Internet browsing and purchasing activity monitored, PremierOpinion sponsors select software that its members can enjoy for free. 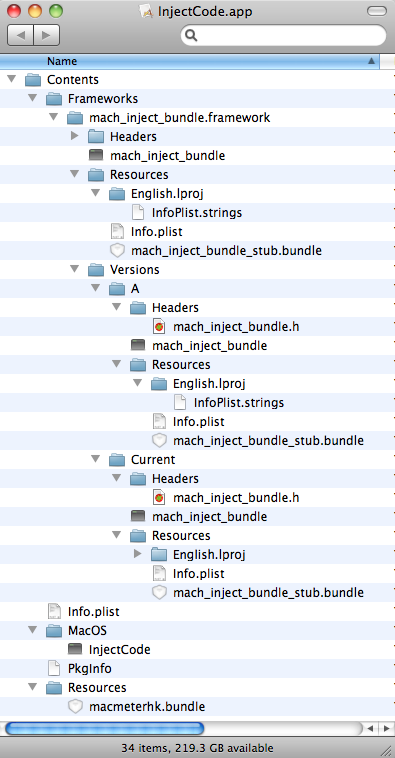 There are 48 screensaver Mac OS X apps in this source, and there are two different packages. 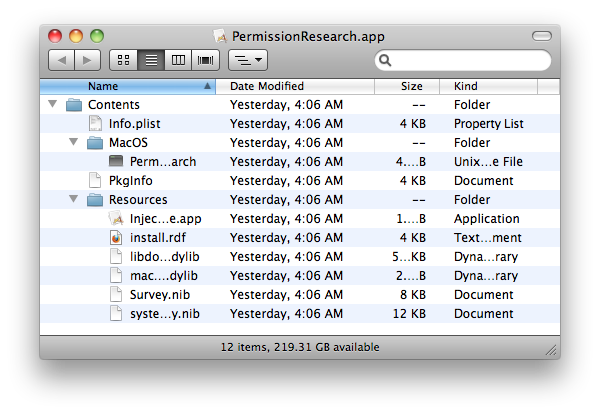 How to spot “PremierOpinion” Mac OS X Spyware? 1. It uses IzPack “Package once. Deploy everywhere.” software installer generator. 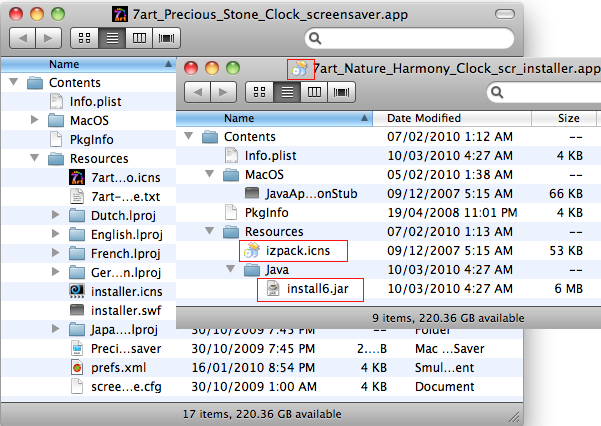 You’ll notice from a package inspection (press control+click on the application and from the pop-up menu choose ‘Show Package Contents’), the icons are different – 7art while the other izpack.icns. 2. IzPack generated installers are in Java Archive (.JAR) file. 3. 7art screen savers installation do NOT require root password. 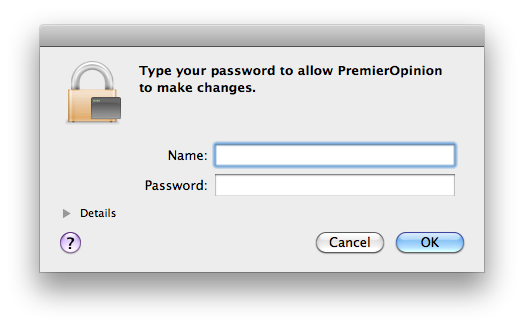 While, PremierOpinion sponsored free software or application requires root password. Why? Because it installs spyware, which will track and monitor users’ browsing behaviour, scans and gather information from the disk and sends back to its remote server. 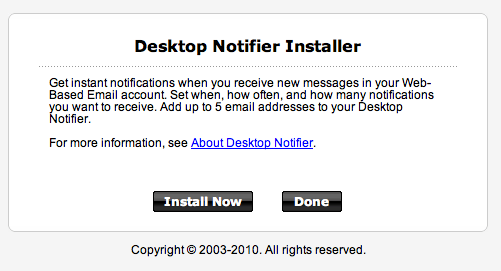 This is very persistent spyware, meaning it does NOT want to be uninstalled. 4. Spyware installs software without user’s consent or notification. It is often bundled with other clean application to misleads users of its true purpose and gain access to users’ system. 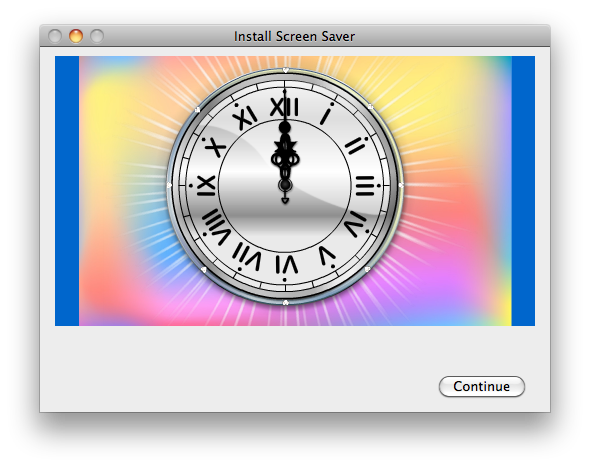 So, in this case, if you click “Cancel”, the IzPack installer will still continue by two pop-up screen: 1) PremierOpinion survey (screenshot) 2) 7art screen saver installation (screenshot). This sneaky Mac OS X threat could be everywhere bundled and distributed in the internet. Be cautious and stay safe! Microsoft Windows uses .lnk as the filename extension for shortcuts to local files, and .URL for shortcuts to remote files, like web pages. Thanks to Jesse Hager for creating the specification document. Please refer this link http://www.wotsit.org/list.asp?al=L and search ‘LNK’ download good reference. As observed, LNK trojan downloaders takes advantage of Command line string to perform malicious activity. exploited by malicious people to compromise a user’s system. Mac OS X 10.6, and Mac OS X Server 10.6. Unspecified vulnerability in Safari 4 on Apple Mac OS X 10.6 allows remote attackers to execute arbitrary code via unknown vectors, as demonstrated by Charlie Miller during a Pwn2Own competition at CanSecWest 2010. There’s a 0-day vulnerability affecting Safari 4.x users, it’s not critical, but it is important to be aware of it. Cesar Cerrudo has discovered this vulnerability, and discussed that Safari wasn’t able to display the LINK specified in href value, instead it reads the stylesheets to redirect to a target URL. Malicious user may take advantage of this vulnerability to steal sensitive information. Be cautious when surfing the net! Now curious thoughts buzzing around, many suspects that Apple is using ClamAV although Ryan Naraine @ zdnet blog had confirmed that Apple is not using it. Others suggest that it might be using Symantec’s engine, because of the naming convention used “OSX.RSPlug.A, OSX.iService.A”. Anyway, in a perspective, it seems Apple is taking no chances with emerging and prevalent threats in Mac (as noted in recent changes). It is taking steps forward to deliver protection and exercise due care – which is good. At the end of the day, security is a process, which lives and deals with reality – our day to day computing activities. Security researches, findings and awareness provides avenue for a better understanding of these (impending) attacks or threats. 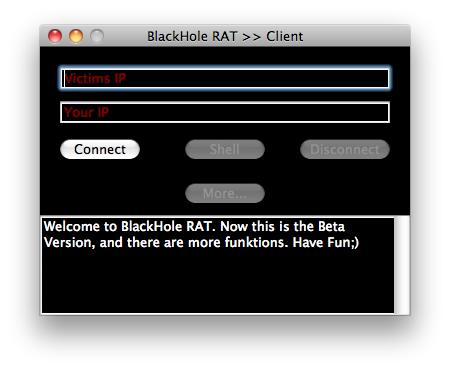 ‘BlackHole’ is the latest remote administration tool (RAT) and is available both in Windows and Mac. Hacktool such RAT employs client-server program that communicates to its victim’s machine through its trojan server. The server application is installed on the victim while the client application is on the managing side. Remote execution of shell commands. Opens webpage using user’s default browser. Sends a message which is displayed on the victims screen. It is capable to perform shutdown, restart and sleep operation. It is capable to request for admin privileges. 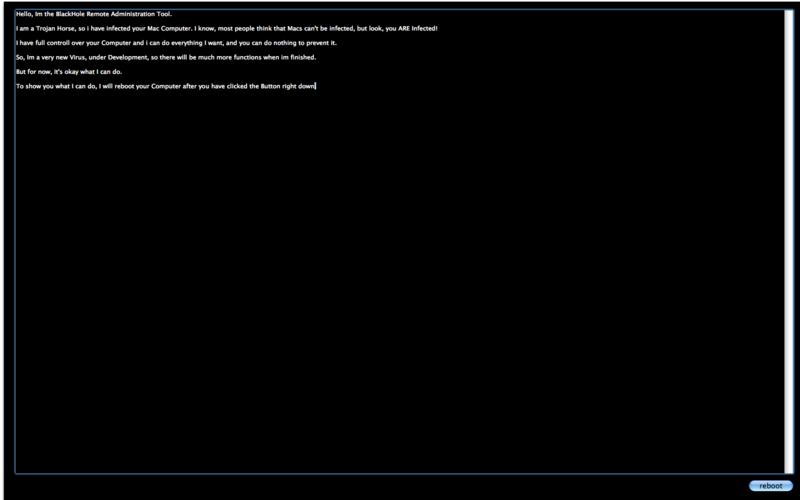 Also, it is also capable to block users screen with this message: please refer this image. Be wary of possible backdoor infection. Report suspicious application, especially if it is communicating to unknown or unfamiliar remote server. When you download an application or installer from legitimate website, you establish a level of trust expecting not to be tricked or deceived. 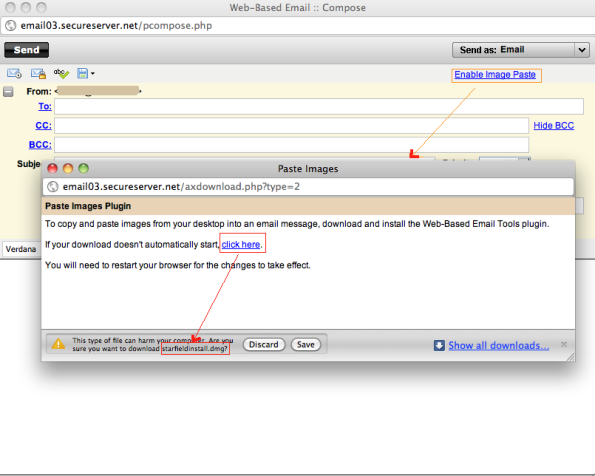 2) It is also offered as “Web-Based Email Tools plugin” promising that this tool will enable image paste. 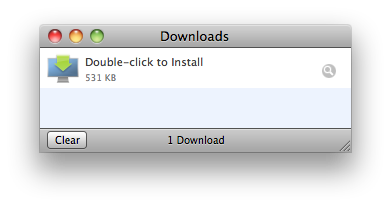 It’s possible that this installer will be distributed elsewhere. 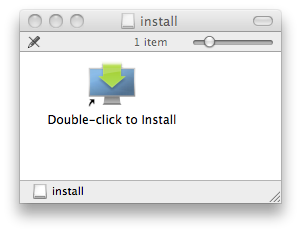 2) It is not the installer itself, instead it is a shortcut link. It is a social engineering trick. It attempts to trigger user’s immediate impulse to respond based from a command or instruction. drwxr-xr-x 7 test staff 306 23 Dec 03:50 .
drwxrwxrwt@ 6 root admin 204 12 Jan 23:42 ..
$ killall Finder Installation: What happens when you ‘double click’ it? You’ll notice that it requires root privilege. 1) It creates a ‘Starfield’ folder in the Application directory. 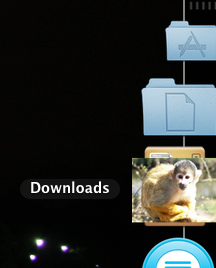 In this folder, you’ll find a copy of itself and an update component. 2) It is set to run at login by adding ‘starfieldupdate’ in the Login Items. 3) It is always running in the background. 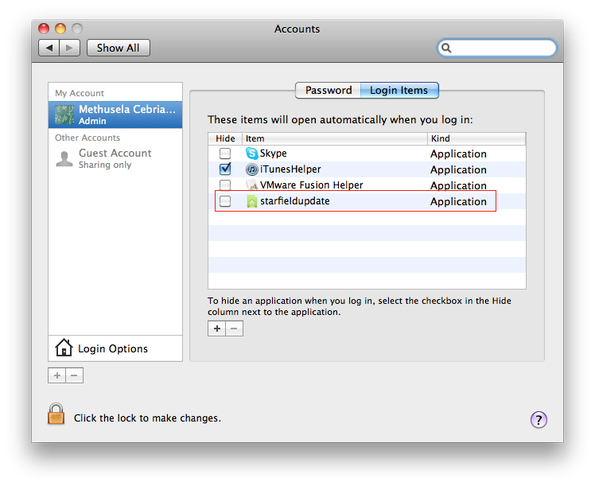 So, when you thought it’s gone, it’s not because ‘StarfieldInstall’ sleeps and activates again to request your password. It will continue to annoy you with repeated request until it gets authorized. Checks user privilege on the system by checking if user is admin or if the user can be elevated to admin. 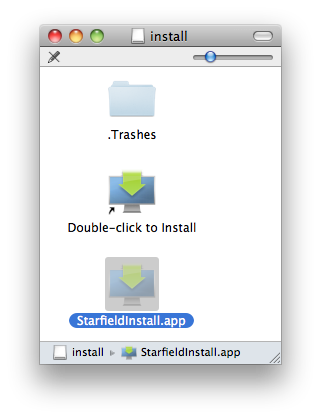 StarfieldInstall launches ‘starfieldupdate.app’ which is kept in the background. ‘starfieldupdate.app’ is responsible for initial installation (first run) and updates. Dumps data log of its activity especially the installation. Notice the name ‘starfield’ in the ~/Library/Logs/ folder. StarfieldInstall.cpp(881): User can become administrator. StarfieldUpdate.cpp(145): User can become administrator. ‘Moduleinfo’ is a JSON text which ‘StarfieldInstall.app’ parses and evaluating the content of a JSON string. For example, it reads and evaluate which package appropriate to the user: Windows or Mac. Another notable process created is ‘OffSyncService’ which is always running in the background . In conclusion, this is a nasty and abusive application that performs remote activities and installation of unwanted plugins and application without user consent. It is a bloatware and a backdoor. Apple Mac OS X Snow Leopard Anti-Malware signature file ‘XProtect.plist’ has new definition detecting “OSX.HellRTS” in the latest Security Update 2010-004 / Mac OS X v10.6.4. 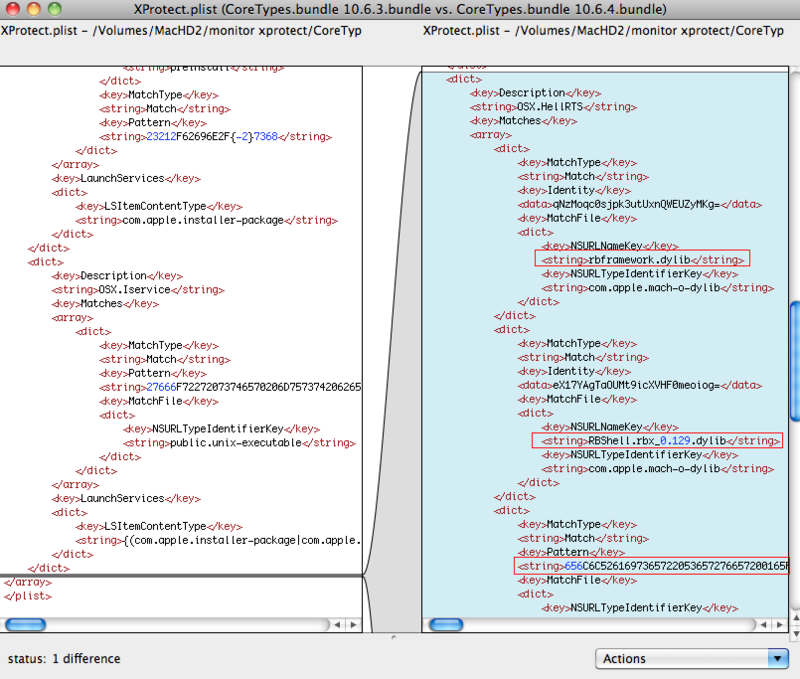 XProtect.plist is stored inside the Resources folder of a bundle called, CoreTypes.bundle. 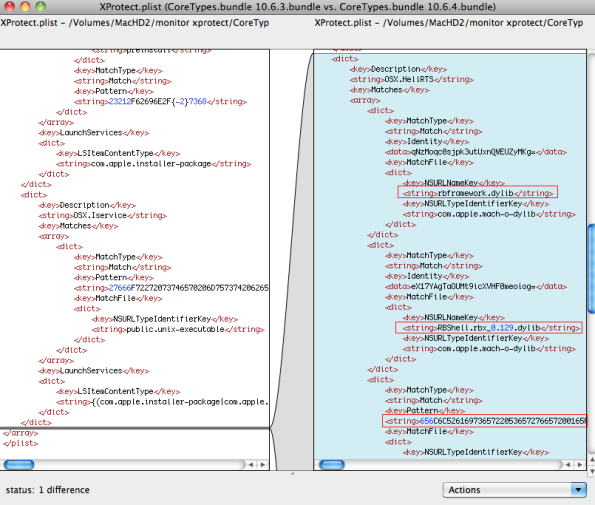 CoreTypes.bundle contains specifications that allow Mac OS X uniquely identify data types, file format, associated icons and UTIs (Uniform Type Identifiers) as defined in the Info.plist file. 1) Risk assessment for Safari extensions(.safariextz) is unsafe, which triggers Mac OS X quarantine feature and displays a warning “..Are you sure you want to open it?”. As shown below, Safari extensions (.safariextz) was added under LSRiskCategoryUnsafeExecutable key. Apple recently released Safari 5 with support for browser extensions, and this security update make sure that nothing gets executed without a warning. 2) Mac OS X Anti-Malware signature file “XProtect.plist” now includes detection for HellRaiser version 4.2 server application. There are 3 definitions for OSX.HellRaiser. As highlighted in the screenshot above, it’s detecting 2 components namely: rbframework.dylib and RBShell.rbx_0.129.dylib, and searches defined hex strings for a pattern matching the Hellraiser server auto launch entry (adding login items) command. The latest XProtect.plist time stamp suggest that it was updated on 24th of April, just couple days after the discovery HellRaiser 4.2 server (in-the-wild). Unfortunately, it seems that it has to wait for the combo update as released on 15th of June. Btw, it is important to take note, this security feature is not capable to detect when the server is already running in background.